Bingen am Rhein is a town in the Mainz-Bingen district in Rhineland-Palatinate, Germany. The settlement's original name was Bingium, a Celtic word that may have meant "hole in the rock", a description of the shoal behind the Mäuseturm, known as the Binger Loch. Bingen was the starting point for the Via Ausonia, a Roman military road that linked the town with Trier. Bingen is well known for, among other things, the story about the Mouse Tower, in which allegedly the Bishop of Mainz Hatto was eaten by mice. 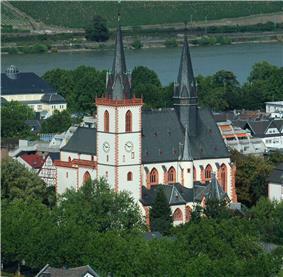 Bingen is situated just southeast of the World Heritage Site. The Rochusberg (mountain) is nearly completely surrounded by the town site. Even before the Celtic (Gaulish) settlement by the name of Binge – meaning "rift". In the early first century AD, Roman troops were stationed in Bingen on the Rhine Valley Road. They changed the location's name to Bingium. There the Romans erected a wooden bridge across the Nahe and constructed a bridgehead castrum. A Roman Mithraic monument, which included a mutilated sculpture representing the nativity of Mithra from a rock, was discovered in Bingen; one of its inscriptions is dated 236. The presbyter Aetherius of Bingen founded sometime between 335 and 360 a firmly Christian community. Bearing witness to this time is Aetherius's gravestone, which can still be seen in Saint Martin's Basilica. After the fall of the Limes, the town became a Frankish royal estate and passed in 983 by the Donation of Verona from Otto II to Archbishop Willigis of Mainz. Under Otto III the Binger Kammerforst (forest) came into being. Under Willigis, some way up the river Nahe, the stone Drususbrücke (bridge) was built. The inhabitants of Bingen strove time and again for independence, which led in 1165 through disputes between the Archbishop of Mainz and the Emperor to destruction. In the 13th century, Bingen was a member of the Rhenish League of Towns. The building of Klopp Castle (Burg Klopp) in the mid 13th century could well be seen as being tied in with this development. A last attempt was the town's unsuccessful participation in the German Peasants' War in 1525. From the Archbishop the Cathedral Chapter of Mainz acquired the town in two halves in 1424 and 1438. Until the late 18th century Bingen remained under its administration. 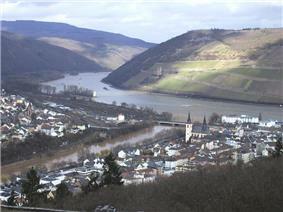 Like many towns in the valley, Bingen suffered several town fires and wars. 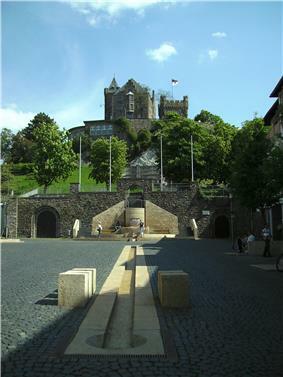 From 1792 to 1813, the town was, as part of the département of Mont-Tonnerre (or Donnersberg – both names meaning "Thunder Mountain"), French after French Revolutionary troops had occupied the Rhine's left bank. In 1816, after the Congress of Vienna, the town passed to the Grand Duchy of Hesse-Darmstadt while today's outlying centre of Bingerbrück went to Prussia's Rhine Province, making Bingen a border town until 1871, when the German Empire was founded. On 7 June 1969, the formerly Prussian municipality of Bingerbrück was amalgamated. On 22 April 1972 came Dromersheim's and Sponsheim's amalgamation with Bingen. The epithet am Rhein has been borne since 1 July 1982. For the State Garden Show in 2008 in Bingen, the Rhineside areas in the town underwent extensive modernization. Benjamin of Tudela mentioned a Jewish community in Bingen in the mid 12th century. Christian inhabitants attacked the small Jewish quarter on Rosh Hashanah in 1198 or 1199, and the Jews were driven from the city. Jews again lived in Bingen as moneylenders in the middle of the 13th century under the jurisdiction of the archbishop of Mainz. In 1343, French Jews settled in Bingen. In 1405, the archbishop declared a moratorium on one-fifth of the debts owed to Jews by Christians, and subsequently the archbishops repeatedly extorted large sums. Noted rabbis who taught in the small community included Seligmann Oppenheim, who convened the Council of Bingen (1455–56) in an unsuccessful attempt to establish his authority over the whole of Rhineland Jewry. After the proposal was opposed by Moses Minz, the matter was referred to Isaac Isserlein, who rejected the project. The Jews were again expelled from Bingen in 1507, and did not return until the second half of the 16th century. The Jewish population was 465 in 1933, and 222 in 1939 due to flight and emigration. The 169 Jews who remained in Bingen in 1942 were deported, and only four ultimately returned. The synagogue was demolished in 1945, and the community was not reestablished after World War II. 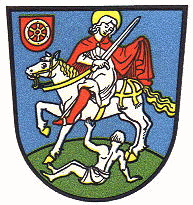 The town's arms show Saint Martin cutting off a piece of his cloak for a poor man, and in a small inescutcheon in dexter chief, the Wheel of Mainz. A new concept was introduced with the Route der Industriekultur Rhein-Main (“Rhine-Main Industrial Culture Route”), along which industrial building works on the 160 km between Miltenberg and Bingen are linked together into an adventure route about the Industrial Age in southern Germany. Already 700 buildings are scientifically catalogued. Bingen was from 18 April to 19 October 2008 host for the Rhineland-Palatinate State Garden Show. The event was held along a 2.8 km stretch of the Rhine waterfront on 24 ha of exhibition area. With 1.3 million visitors, the expected number of 600,000 was greatly exceeded. The region is characterized economically by winegrowing, all the more so as in Bingen, three winegrowing areas (Rheinhessen, Mittelrhein and Nahe) meet. The town is also the winegrowing Bereich's (Bereich Bingen) namesake in German wine law. Other industries, which once did business in Bingen when there was a harbour, have left the town over the years. The service industries found here today are found mainly in the industrial park (Autobahn interchange Bingen-Ost / Kempten / Industriegebiet) and in the Scharlachberg commercial park. Tourism also plays an important role. The main railway station, Bingen (Rhein) Hauptbahnhof lies in the outlying centre of Bingerbrück. It is served as a regional station by InterCity trains as well as one ICE line. Bingen (Rhein) Stadt station lies 2 km farther east, right across from the historical harbour crane. This station is only important for local transport. Furthermore, there is also a stop in Bingen-Gaulsheim. The reason that two railway stations arose in Bingen is historical. The main railway station was originally a Prussian border station built by the Rhenish Railway Company on its West Rhine Railway, while the station in town belonged to the Hessian Ludwig Railway. The stops at Drususbrücke on the Bingen Hbf-Bad Kreuznach line and Bingen-Kempten and Büdesheim-Dromersheim on the Bingen/Rhein Stadt–Alzey line are no longer served. Bingen lies right near Autobahnen A 60 and A 61, which are linked to the town by Bundesstraße 9. Only private transport is still of importance today. The cargo harbour has been abandoned. The former winter harbour is now a marina. There are landing stages of the tourist lines Köln-Düsseldorfer, Bingen-Rüdesheimer Fahrgastschifffahrt and Rösslerlinie. A passenger ferry and a car ferry link Bingen with Rüdesheim. Until the late 1970s, Bingen was a piloting station. Hildegard of Bingen (1098–1179), abbess and author, mystic, writer, composer, musician, and medic. After her the Bingen girls' school (Gymnasium and vocational school), the Hildegardisschule (“Higa”), is named. On 7 October 2012, Pope Benedict XVI named her a Doctor of the Church. ^ "Gemeinden in Deutschland mit Bevölkerung am 31. Dezember 2013". ^ Sidney N. Deane. "Archaeological News". American Journal of Archaeology 28 (3 Àdate=July-September 1924): 344. ^ Heinrich Gottfried Philipp Gengler: Regesten und Urkunden zur Verfassungs- und Rechtsgeschichte der deutschen Städte im Mittelalter, Erlangen 1863, S. 224.